MARTHA MOMENTS: Martha at Walmart? Martha also announced that she will soon be appearing in a television ad for Wal-Mart. A very special thanks to Paul for the info. My friend Kenn - always the persistent detective - was the one who actually called the radio show to ask Martha about the Wal-Mart line! He also broke out his best disguise, swallowed his pride and ventured out to Wal-Mart to check out the merchandise for himself. 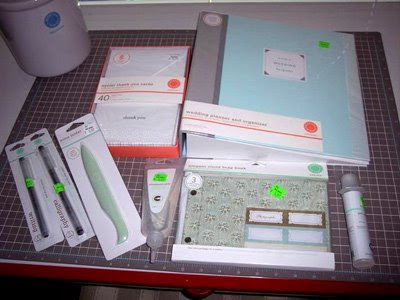 Below is a sample of what he found: thank-you note cards, a binder, craft glue, a glue stick, labels, a bone folder and calligraphy pens. Raising the bar at Wal-Mart? It's a good thing. Thanks, Kenn! I'm not sure how I feel about Martha appearing in a WalMart ad. I do know that even Martha will not get me to set foot in a WalMart. I'll stick to Michael's for my Martha Crafts needs. Wal-Mart? This is so very disappointing. Wal-Mart is not the place for Martha. I hope this move is not the first sign of a full-blown merchandise transition from K-Mart to Wal-Mart when the K-Mart deal expires in two years. Sarah, I'm with you - I'll stick with Michael's, too. Sarah and Kevin, I understand the disappointment, believe me. It's not what I'd call "exciting" news. It's early days, still, but it looks to me like Wal-Mart is the leading contender for Martha's wares after her Kmart deal expires in 2010. And it would be very good business for Martha - even if it's tacky. Wal-Mart is the largest corporation in the world. If Martha could get a chunk of that, the company might show strong profits for the first time in years. ...And you know Martha: it's always business! But shopping at Wal-Mart is not my idea of a good thing. Also, Wal-Mart is found in every country, for better or for worse. For Martha, it's better. Just as a side note... Martha noted in her conversation yesterday on Ask Martha (yes.. it was me that called in and asked about it) that the "Create" and "Celebrate" lines are exclusive to Wal-Mart. 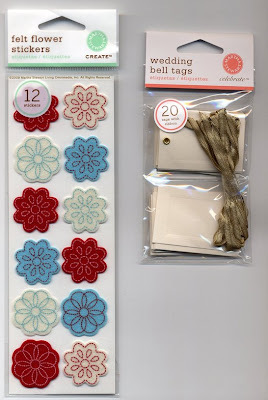 While similar items might be found at Michaels (create v crafts the Celebrate line will only be found at Wal-Mart. I'm holding my breath on this business arrangement. I'm going to wait and see what happens. In some ways (distribution, mass market, availability, price point) it makes agreat sense for MSLO.) On the other hand, it's the perception thing.. though, people said the same of the Kmart association. Time will tell. I just learned that Wal-Mart has refreshed it's logo. Maybe they want to change their image. Martha could come handy. Well, anyways - I'm quite shocked about this development. I'm very disappointed to hear that Martha is going to be at Walmart. If she doesn't renew her deal with Kmart in 2 years then I guess I won't be buying any of her products. I can't stand Walmart. Thanks, Alan! I'll have more on the line in tomorrow's post. I am an enormous fan of Martha (I’ve subscribed to her magazine for years and years). Have all her books and love all things Martha. That’s why I was just devastated to learn she was making the move to Walmart. I (unlike about 75 percent of the Canadian population) have NEVER shopped there, on principle, and I never will. I’m sooooo disappointed by this move by MSO. I don’t know what to think. It’s perplexing – I mean, surely she knows what Walmart is all about. Very upsetting to say the least.